Bake a sheet cake the size that you need. 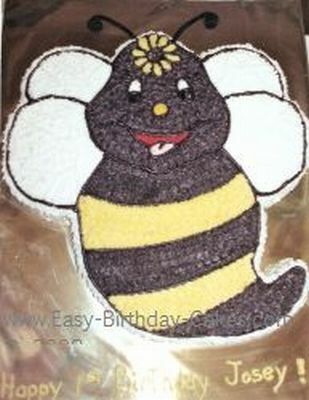 With an icing filled bag and round tip, size #5, draw the bee on the cake top. Cut the cake away from the bee shape. Make black icing and outline the entire bee. Fill in the tongue with light pink icing. Fill in the mouth with red icing. Fill in the black areas with tire black icing. Fill in the yellow flower and the strips with yellow icing. Fill in the wings, eyes and sides of the cake with white icing. The antenna are black pipe cleaners shaped and stuck into the bee cake. You will use the round tip, size #5 to do all of the outline work and the star tip,s ize #18 to do all of the fill in work. This is a cute cake to make for a bee themed birthday party. There are also some cakes on our site from the Bee movie if you are looking for that time of Bee cake. They are really cute, so browse below to see the other bee themed birthday cakes that are on our site. Also, if you end up making or have made a bee themed cake, we would love for you to share it with us, so please come back and submit your cake! Just scroll to the top and hit the Submit Your Cake button that is located at the top. See Bee Cakes That Were Submitted By Others To This Site!